A sketch of Chae Je-gong, a respected statesman (1720-1799), is Treasure Number 1477 that was drawn by Yi Myeong-ki, the most renowned artist of the Joseon Kingdom. The work realistically portrays Chae’s squinting eyes and his darkskinned face while adding shadows to the face and hands to give them threedimensionality. There are traces of the artist’s attempt to redraw the shoulder line visible in the painting, revealing that the sketch went through numerous revisions to find the perfect contours for the final portrait on silk. There was a time when portraits meant more than paintings. They were regarded more as spiritual artworks, vividly capturing the models' souls and postures. For that reason, both the portrait and the sketch were highly appreciated because the process was believed to instill vitality and spirit into paintings in the past. The National Museum of Korea is holding an exhibition titled ``Portrait Sketches of the Joseon Dynasty'' to show the painting skills and techniques during that time. The exhibition which is being held in the painting room of Gallery I of the Permanent Exhibition Hall, will continue to run until Oct. 28. The exhibit features 35 artworks, including the Portrait Sketch of Choe Deok-ji (Treasure Number 594). Focusing on portrait sketches, dubbed ``chobon'' in Korean, the exhibit has received little attention from the academic world so far. The basic sketches functioned as a preliminary work that offered a preview of the portrait before the final version was born on silk. The exhibition not only shows the end-results, the actual portraits, but also the process in which the sketches translate into the finished product. Among the many complicated procedures in the painting of a portrait, the initial sketch was highly regarded, and proved most challenging. The portrait sketches still exist today but the faces in the past sketches are so detailed as to be equivalent to the final works. ``Painters drew the sketches first by attempting various styles of details such as eyebrows and lips, choosing the greatest result as their completed work,'' Lee Soo-mi, curator of the museum, said. Lee also said that during the Joseon era (1392-1910), if portraits perfectly captured real persons but not the spirits and personalities of the models, they were disregarded. The work is a facial portrait of Chae Je-gong at age of 73, drawn in 1792. 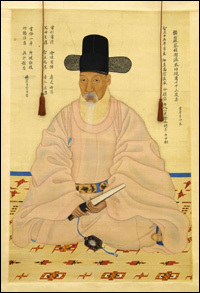 Chae sits on a neatly woven mat wearing a pink official uniform that reveals faint traces of blue from his undergarments. According to the museum, for a portrait painting, the artist drew the contours in charcoal on oiled paper. He or she then painted over them with ink, applying colors in areas from the back. The museum said that this technique allows the colors that were applied from the back to show through faintly on the front. The technique of painting on silk from the back allows the colors seen through the silk strands. Oiled paper - paper that has been made transparent - produces the same effect. Once the sample painting was completed, patrons commented on the sketches and affected the appearance of the final painting. The curator said that the techniques _ sometimes discovered in the Buddhist paintings of the Goryeo era (936-1392)_ are very rare in Korean traditional paintings. To increase the public's understanding of portrait sketches, the exhibition offers an album of portrait sketches by Im Hui-su. The exhibition also includes the Portrait of Choe Deok-ji (Treasure Number 594) and its original sketch. Visitors have the chance to compare the preliminary works with the completed works through this exhibition. In order to directly highlight the painting process, the exhibition allows visitors to experience reproduced pieces of the Portrait of Yi Eui-hyeon from the Album of Pleasant Gathering of Elders (1744) in seven stages of portrait painting. In conjunction with this exhibition, two portraits of Yi Seong-yu are on display for the first time. Yi Seong-yu (1713-1791) served as a government official under King Yeongjo and King Jeongjo. The double portrait depicts the 70-year-old Yi in his official and military uniforms. 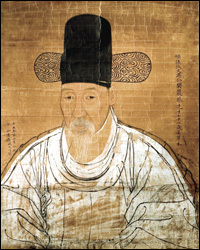 This portrait is unique in that it shows the same person in two different uniforms, adding another dimension to Joseon painting. The museum has published a catalog featuring the museum collection and presenting new academic themes. This publication is currently available for purchase. For more information, call (02) 2077-9485.